Sombrero-free Cinco de Mayo celebrations: luchadores, chili poppers and lots and lots of tequila…. Celebrate Mexico's victory at the Edison with $1 shots of Casa Noble tequila. Cinco de Mayo commemorates the Mexican victory over French forces in 1862. But you knew that…. Cinco de Mayo isn’t widely observed in Mexico but that shouldn’t stop you from hoisting a glass to celebrate the triumph of tequila and mezcal over champagne. Here are a handful of barras y restaurantes where you’ll have the least chance of getting an embarrassing picture taken of you wearing a giant sombrero while soused on Sauza. The Edison downtown may be more grand than guerilla but drink like a wage worker with $1 shots (1 per person) of Casa Noble tequila from 5:00 – 7:00PM. Willie Martinez y Mombo Loco will perform at 7:00PM with DJ Tatiana accompanying. Plot your next uprising amidst the underground artifacts of the city’s first power plant. The doors at Las Perlas open at 4PM to give you an early start on the $4 Tecates, $5 shots of El Jimador Blanco Tequila, $6 shots of Herradura Antiquo, and $7 margueritas and shots of Herradura Blanco. There’s no $8 special but at 9:30PM, DJ Jose Galvan (of 103.1 FM) helps you count down the night with Latin and Mexican beats in the Oaxacan inspired charm of downtown’s temple of tequila and mezcal. If you’re a reality T.V. junkie, you probably already know that Ciudad‘s Susan Feniger, one of the Too Hot Tamales, has been competing on Bravo’s Top Chef Masters. Ciudad will host a TCM viewing party on Cinco de Mayo with $3 tacos, 1/2 off Mojitos and Margueritas, and “special surprise tastes” of one of Ms. Feniger’s TCM dishes. RSVP by TODAY, May 4th if you’re craving a gourmet, Cinco de Mayo experience with your Wednesday night T.V. fix. If you couldn’t get tickets to Lucha Va Voom’s sold out “Cinco de Mayan” extravaganza, head over to “modern Mexican” Provecho Restaurant. In addition to $2 mezcal shots, $3 Dos Equis, and $5 Cazadores margueritas, the sleekly beautiful bar and restaurant will host one of the wildest nights in town with burlesque, luchadores, and mariachis. Ay, ay, ay, ay! Lula Cocina Mexicana was voted one of North America’s best tequila bars – they only serve 100% Blue Agave tequilas and mezcals and have over 300 varieties – so you know they know how to throw a party. 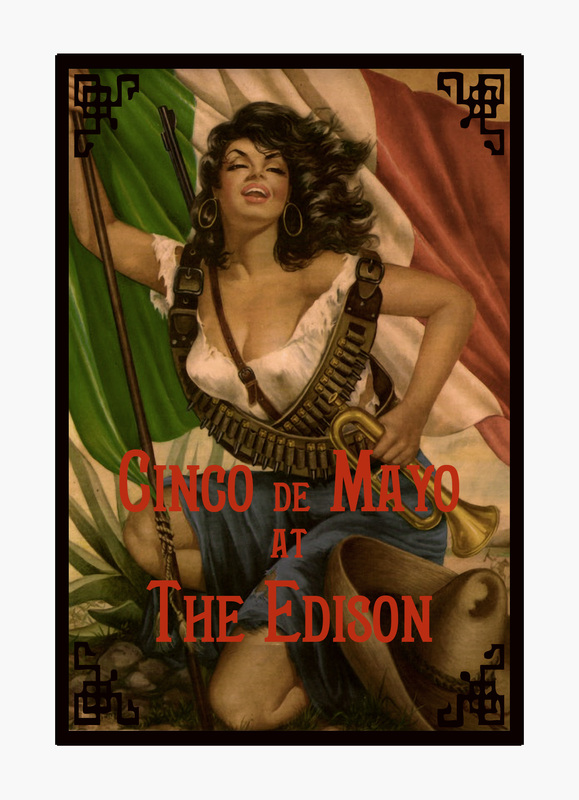 On Cinco de Mayo, you can roll out of bed and start toasting la revolucion at 10:00AM with special tequila and liqueur promotions; David Duque will perform with Mariachi Mexican Colonial. Don’t turn into un nasty borracho though; roaming magician David Groves might turn you into un canejo and pull you out of a hat. And the whole point of the evening is to avoid the sombreros, remember? Get your caliente on at Border Grill from 11:30AM to 10:00PM in the bar. In addition to $3 Border tacos and $5 bites, desserts and drinks (except for the Bacardi mojitos, which are $5.50), the Two Hot Tamales offer a chili challenge: if you can finish a Fresno Chili Popper, a Jalapeno Popper, and a Serrano Popper, they’ll give you a Habanero Popper free! Ms. Go Go assumes this is a reward for a job well done but it’s really a good thing those drinks are so cheap…. Next Post “Blood & Dumplings” and “Absinthe, Opium & Magic: 1920’s Shanghai”: Chinese geishas and the San Gabriel Valley.